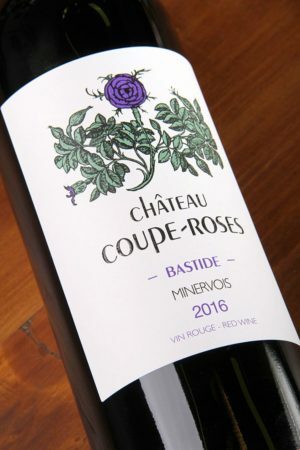 Château Coupe-Roses is a child of Minervois, little area situated North-East of Carcassonne, and South from Montagne Noire. Its climate constitute an harmonious synthesis between Mediterranean sun and mountain freshness. 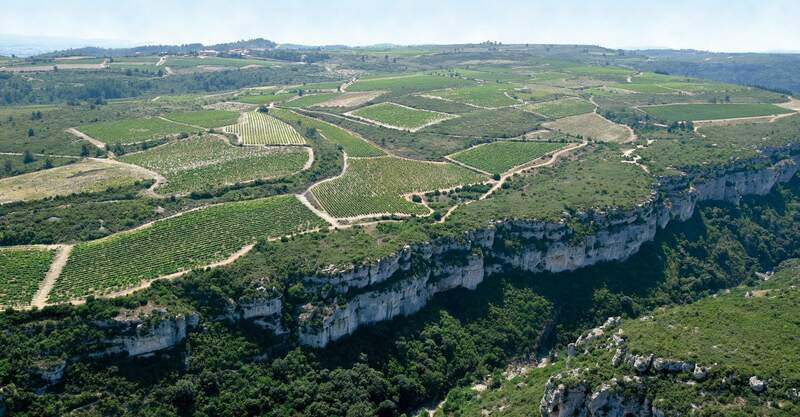 This altitude influence is mostly situated in the Causse region, where our cellar and vines are, consisting of little plots which totalized 45ha (about 90 acres). Those plots are growing on dry and rocky uplands, between 250 and 400m. Thermic amplitudes are important and contributes to give a slow maturation to the vines, with an increase in acidity which exacerbates aromas. The soils alternates between solid limestone, which keep the heat, and clay layersmore profound which keep runoff water. These clays are rich in Manganese, which gives it a red color. 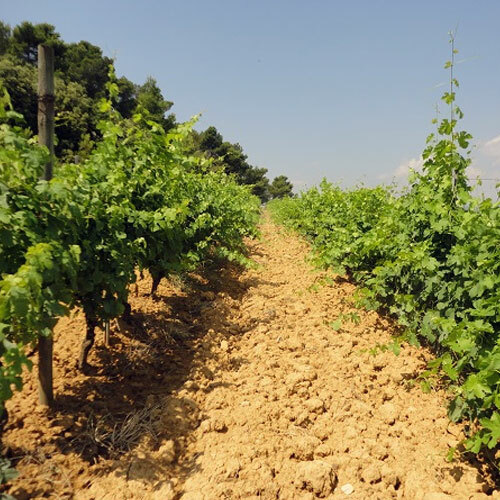 All these terroir’s qualities have to be highlighted by a respectfull know-how : Each plot welcomes the grape variety that is the best suit for it, soil enrichment and treatments are reduced, and organic, while profound rooting is favorised. 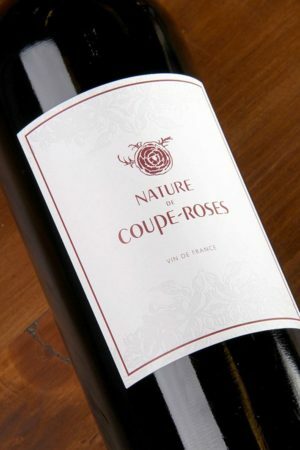 our wines are the fruits of this complex alchimy, of this permanent dialogue between nature and human hand. 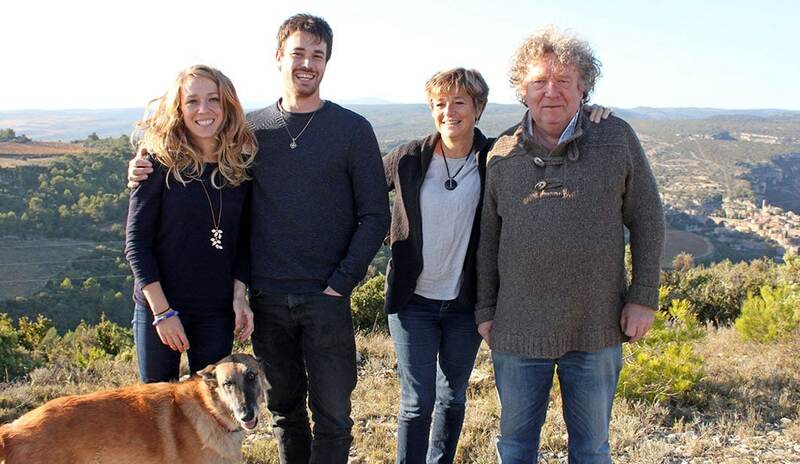 The languedoc-part of Francoise’s family was for a part, tilers between XVII and XIXth century. The ovens were on the actual vinification cellar. 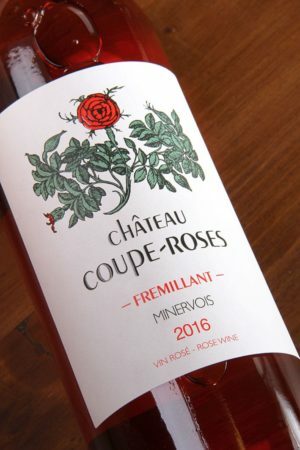 Toponymy teach us that this site was named “Fabrique de Coupe-Rose” (Litteraly Coupe-Rose factory), without the plural “s” at this time. 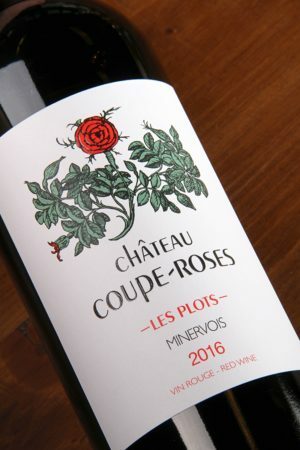 The clay used, which was full of manganese ans so pink/red, was named Coupe-Rose. This tiles were more expensive than others, because Coupe-Rose clay was famous at the time. 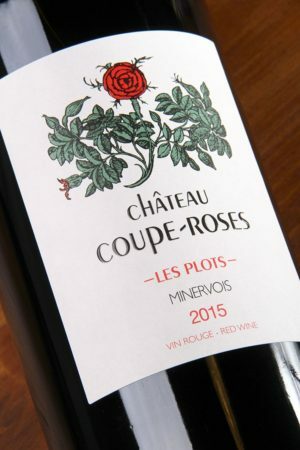 Coupe-Roses is made from an aarchipelago of little plots. Clays are varied, each has to be apprehended in its own way. Babio vines are the most cleyey of all. The purplish-red streaks, well pronounced after rare rains, attest to the abundance of Manganese ion. The internal surfaces of this clay are moderatly low. 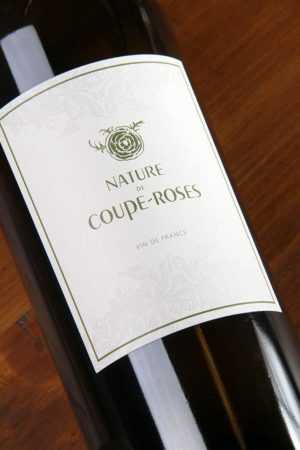 White grapes are very comfortable there to offer us aromatic and structural expressions, supported by a welcome acidity. On this land, three plots are implanted. 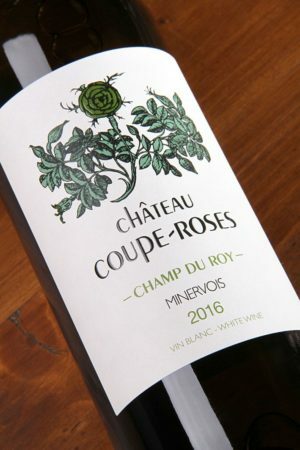 Grenache Blanc will be married into Champ du Roy wine. 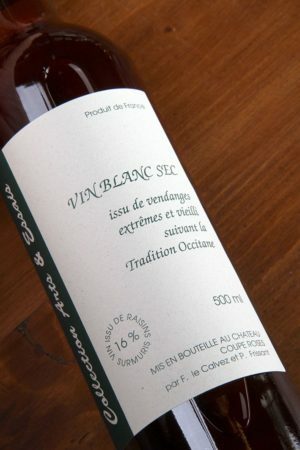 Viognier gives us with extreme parcimony, a little grape cuvée, stricly pure, simple and delicious. 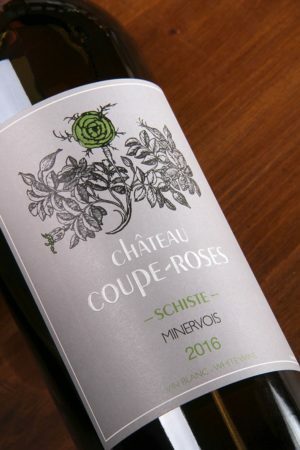 A third plot is planted in Roussanne, wih just a little bit of Marsanne ; It gives us sometimes late harvests that are vinified in old Rancios wines, according to our peasant tradition. 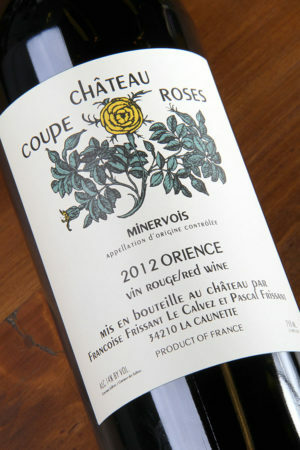 But most of the times, we blend this plot with our schist Roussanne into the Minervois Blanc cuvée. Other clays, less pure, accumulates in colluvium behind the massive rocky walls, like on the Chemin des Crozes(1). 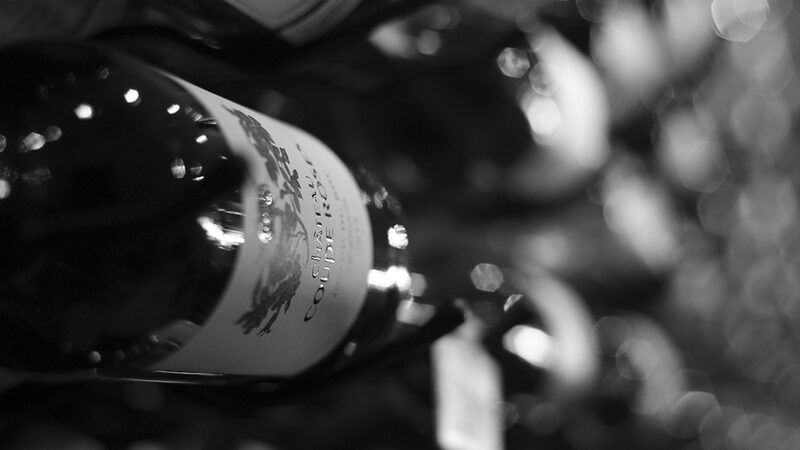 The Carrignan finds here a nice balance, amplified by its association with Grenache Noir. We also have clays that migrates with every rain from abandonned plots of Babio, and cover enormous rocks. On this chaotic areas, we implanted olive trees. Just below, in the Cesse(2) riverbed, clays makes bounds with sands and gravel. Everywhere, clays are an agronomic puzzle. The microbian life awakening, and the better knowledge of organic material virtues, are promises of new oenological prowess. (1) : Occitan name for rocks and cliffs crevices. (2) : Large Mediterranean river. 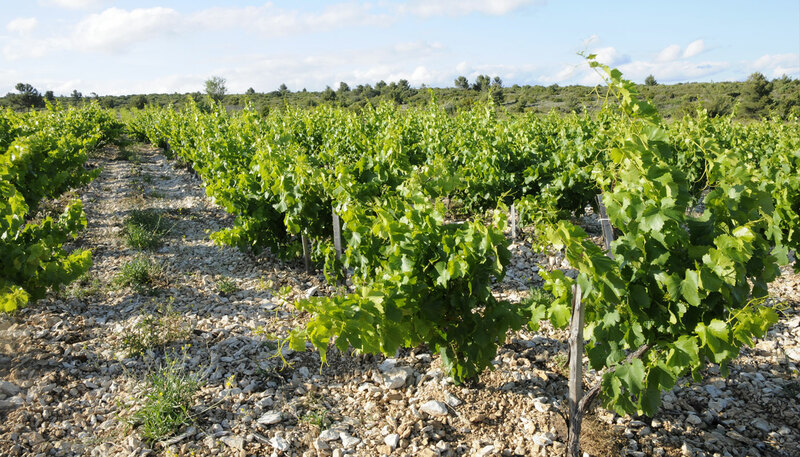 Vineyards planted on schists always give very remarquable and singular wines. 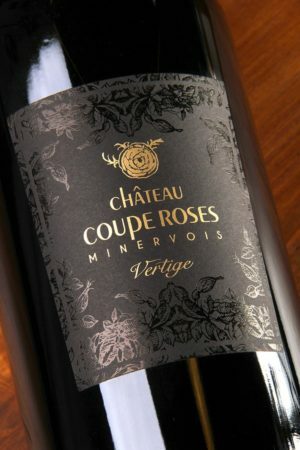 Some of them beneficiate of an international and old recognition (Collioure, Banyuls, Faugères, etc). 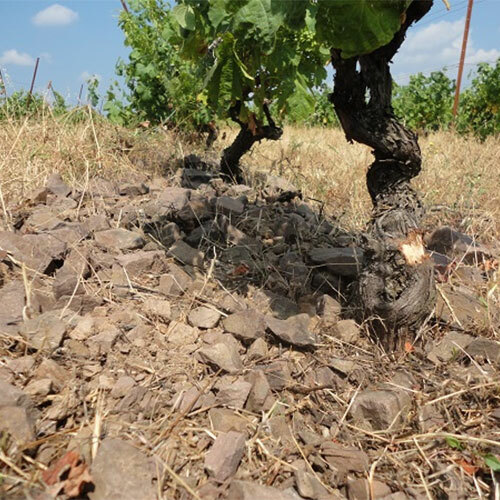 Some great schists vineyards may sleep under wastelands that human history has not given the opportunity to flourish. The schist that makes up our Roussanne plot are from pre-cambrian era (the first and longest period on geological time scale). This plot soil directly come from ones of the oldest soils degradation. These soils are extremly poor, the roots implantation is very slow, because of the horizontal organisation of our schists. In the picture, you can see that proportion of land is very low, which isn’t good for water retention. The vegetative phase is a translation of this extreme lack of water. The regular and organic soil enrichment allows us to keep a good microbian life, which promote the very slow rooting mecanism. All these leads to a very low yield (15hL/HA, about 7hL/Acre), and highlight original expressions, marked by vegetal (especially Heather) and empyreumatic touches (tobacco for instance). 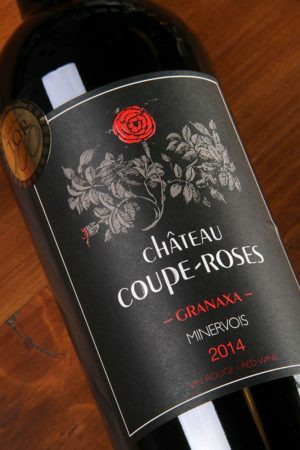 Harvest between 13.5 and 14 %vol., we are in front of a real “cru”, in the strict oenological terms. 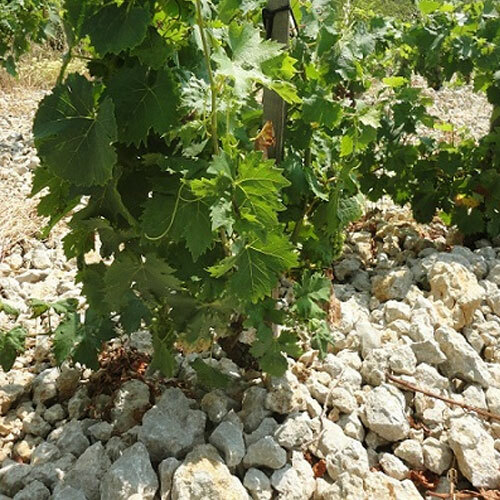 The main place where this terroir takes place on our land is ont the “Sieure” vine. 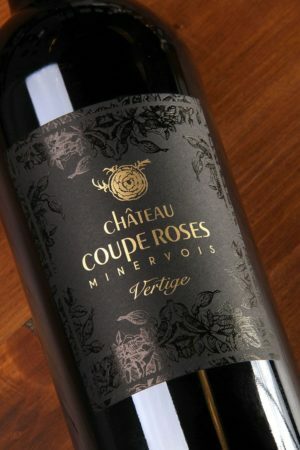 The Karst land of this vine extends to Saint Jean de Minervois ; You can read it on the steep cliffs of “La Cessière”, which draws the limit between Saint Jean de Minervois and La Caunette. Climbers knows well this preservated areas. Here the grainy red clay is hiding behind white stones. Its strong organic and liquorice scent attest of nice conditions for a profound rooting. 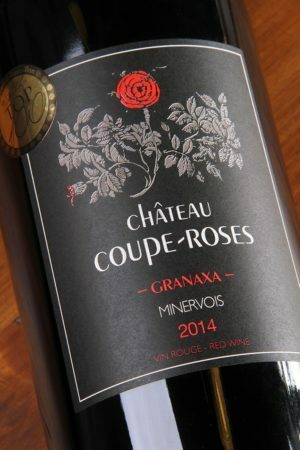 The wine that come from Sieure vine is called “Granaxa”. 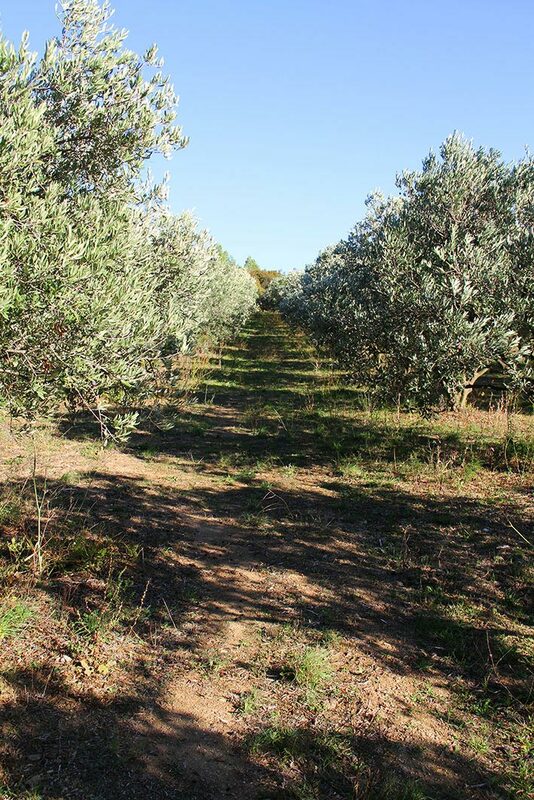 Our olive grove is planted on terrace uplands. 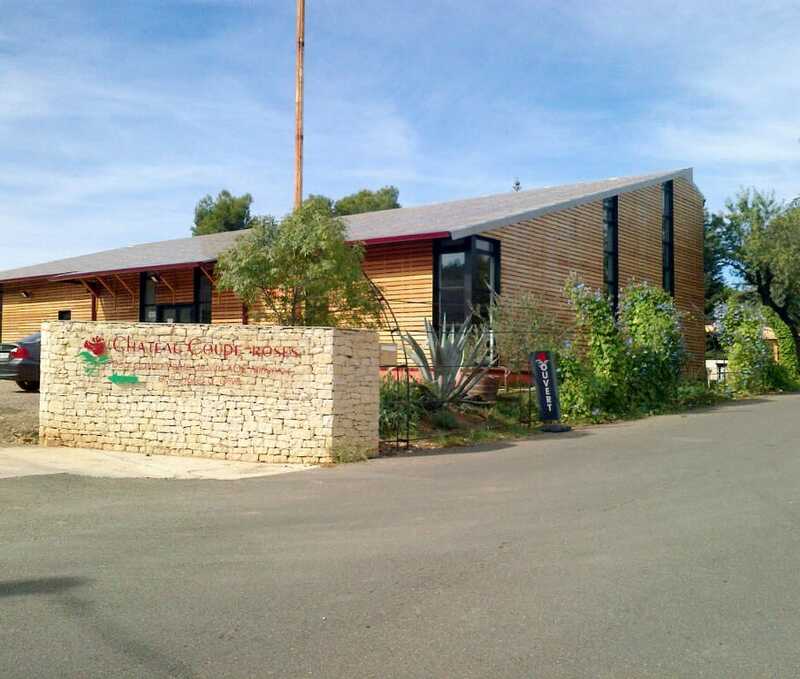 The olive trees benefits of a very clement mediterranean climate. The trees aren’t irrigated and their growth took more than ten years to offer us a real production. 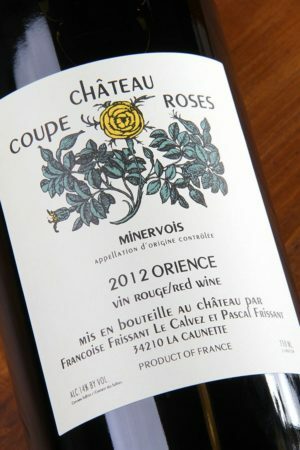 We planted local varieties : Picholine, Lucques, Olivière, and others that came from Vallée du Rhône : Aglandau and Bouteillan. The harvest is late in the season, we let the olives ripen as much as possible ; The harvest is then made manually, by netting the soil under the trees. We obtain a very fine oil, very fruity, with a ardent and complex final on mouth. We bring the harvest in a little mill, without any leaves or stem. The olives are then pressed by the grindstone, and the resulting paste is pressed mechanically. 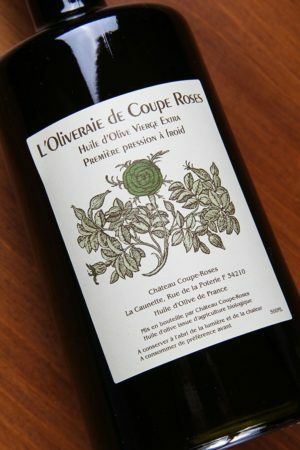 We obtained an oil, which is a “Première pression à froid” (First cold press literally). Olive oil is rich in antioxidant, like vitamine E and polyphenols (also presents into wine), which prevents from heart disease, some cancers, and slow down the body’s aging. Olive oil is also rich in monounsaturated fatty acids, which, unlike to saturated fatty acids, reduce the “bad” cholesterol. Olive oil stimulates the pancreatic lipase and bile secretion. A copious meal will be assimilates better by the body if prepared with olive oil. Olive oil is very recommended to people that are subjects of ulcers and gallstones. The advantage of this particular oil, in comparison with other vegetal oils, is that it’s the only one that is not refined, deodorized and decolored. Its the only one to contain phenolic compounds in good quantity. It’s a terroir olive oil, handcrafted and organic. It has a very unique taste. To commande thank you to register (the ID and password of the old site are no longer relevant).